I finished the berry emery too! Ahh que preciosidad. Is very very beautiful. Love it.. and the strawberry is so cute!!! 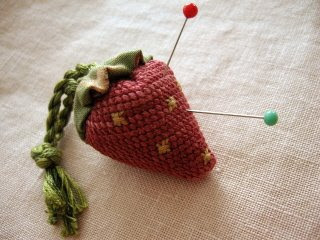 Good luck with the pincushion!! Nice job. Love the emery. It's beautiful! 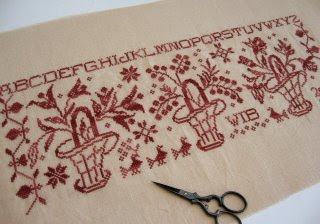 You always stitch these up so fast, you're the Queen of the Loose Feathers! Love that little emery, too cute! Wow! Great work, and what a gorgeous strawberry.